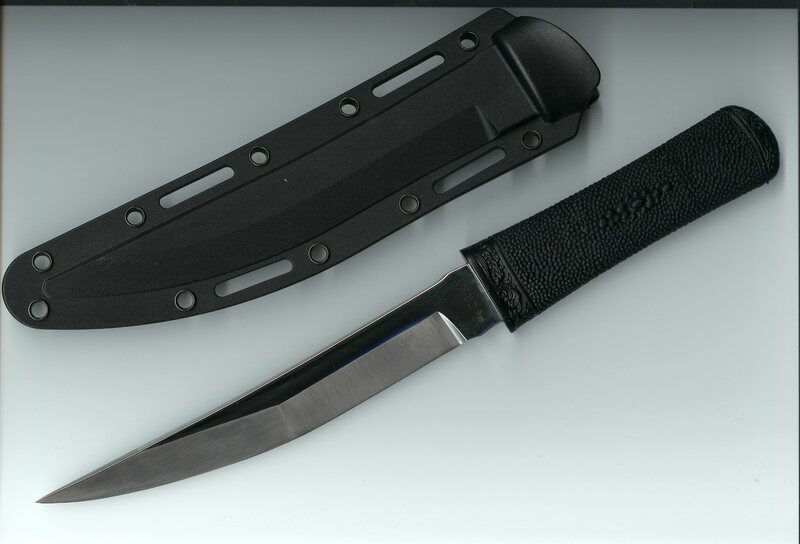 CRKT Hissatsu Combat/Tactical Tanto Knife: A Japanese-Style Solution for Modern Spec-Ops/Tactical CQB Problems. | DefenseReview.com (DR): An online tactical technology and military defense technology magazine with particular focus on the latest and greatest tactical firearms news (tactical gun news), tactical gear news and tactical shooting news. 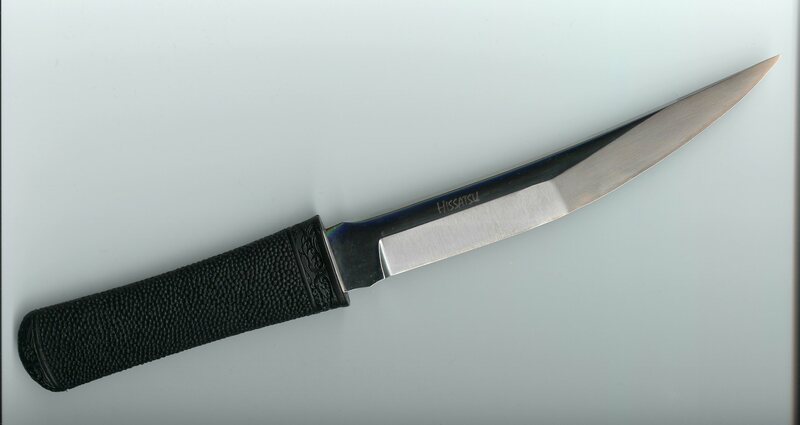 Some of you may remember the original “Hissatsu” that was manufactured for and marketed by Ancient Edge/Bugei Trading Co. in very limited numbers several years ago. Well, it’s back. Once again, it’s brought to us (in slightly modified form) by Ancient Edge/Bugei Trading Co., only this time they’ve partnered with Columbia River Knife & Tool (CRKT), who will be handling manufacturing/production. CRKT is known for offering high quality production knives at affordable prices, i.e. knives that give you a lot of bang for the buck. This is most likely one of the reasons why James Williams of Ancient Edge/Bugei Trading Co. chose them for the latest incarnation of the “Hissatsu”. Williams wanted to make the new CRKT Hissatsu easily affordable for military personnel, who are are usually on limited budgets. CRKT was able to help Williams turn that goal into reality. a firearm in handling the problem. This is where the Hissatsu comes in. It’s important to note that maintaining silence may not be the only reason to employ the Hissatsu. During rapid movement down a tight hallway, it may be just plain unsafe to one’s teammates to employ a firearm (MP-5, M4 Carbine, or SOPMOD CQB Subcarbine, or even a SIG Sauer P226, MEU SOC 1911 pistol, or USMC MCSOCOM 1911 pistol), due to field-of-fire and potential ricochet issues. In order to make full use of the Hissatsu’s unique design capabilities, the operator must be trained specifically in its employment by an expert like Mr. Williams. The Hissatsu is essentially a modernized/updated Osoraku-Zukuri style tanto. James Williams had this to say about the Hissatsu: “This style of Japanese tanto is called ‘aikuchi’ and does not have a guard. It is actually quite common for Japanese tanto not to have a guard. “Aikuchi” basically means “without guard” and has nothing to do with the blade shape.” The Osoraku-Zukuri blade style features a very long point, or kissaki. The point section on an Osoraku-Zukuri style blade is actually as long or longer than half the blade’s length. This applies to the Hissatsu. According to this web page, the Osoraku-Zukuri blade style is apparently a rare form originated by Shimada Sukemune in the late Muromachi period of Japan. The Hissatsu does away with the traditional japanese (blade) guard, or tsuba. This is for the purpose of both carryability and deployment. Williams wanted to make the Hissatsu as low-profile as possible. A guard (tsuba) might snag on the rest of a Spec-Operator’s gear when he attempts to deploy the knife quickly under stress. The Hissatsu’s handle, or tsuka, is made out of kraton, and features a faux rayskin texture. This allows for a very secure grip, even when the handle gets wet. The handle is also angled so that it gets wider toward the blade. Basically, the handle is flaired at both ends. You can see this in all of the pictures that accompany this story. The handle’s increasing gradient towards the blade creates more pressure against the grip when the knife is thrust into something with force, so the operator’s hand is less likely to slide up and over/along the blade. There are some raised scales/nodules on the left side of the handle for the purpose of indexing the knife in low-light/no-light conditions. Blade material is AUS-6M, with a Rockwell hardness of 55-57 HRC. The blade is roughly 7″ long at .20″ thickness. Overall length of the knife is 12.12″. Weight is 8.0 oz. Suggested retail price for the Hissatsu is $99.99. DefRev recently received a CRKT Hissatsu for evaluation. I should note right now that none of us over here at “Defense Review” are knife experts by any stretch of the imagination. Speaking for myself, I live in Miami, and only carry an Emerson Commander clip-it folder as an all-around tool (read that as letter and box opener) and back-up to my trusty Glock 19 compact 9mm pistol, which I keep fully loaded with a high-capacity pre-ban mag (giving me 15 rounds + 1 up the pipe). I also carry a spare loaded 17-round mag in my left-front jeans pocket (which I always try to make sure is free of lint and schmutz), in case I have to do a reasonably quick reload. The reason I digress like this is so the reader understands that I’m really a “gun guy” (as opposed to a “knife guy”), and my knowledge of knives and tactical knife use is limited. This is partially due to the fact that, in Miami, you never want to bring a knife (by itself) to a gunfight, which is what you’re most likely to get into down here, if things go really badly, and the proverbial crap hits the fan (God forbid.). Now that that little disclaimer is out of the way, I must say I’m impressed with the knife. The CRKT Hissatsu appears to be a hell of a lot of knife for the money. 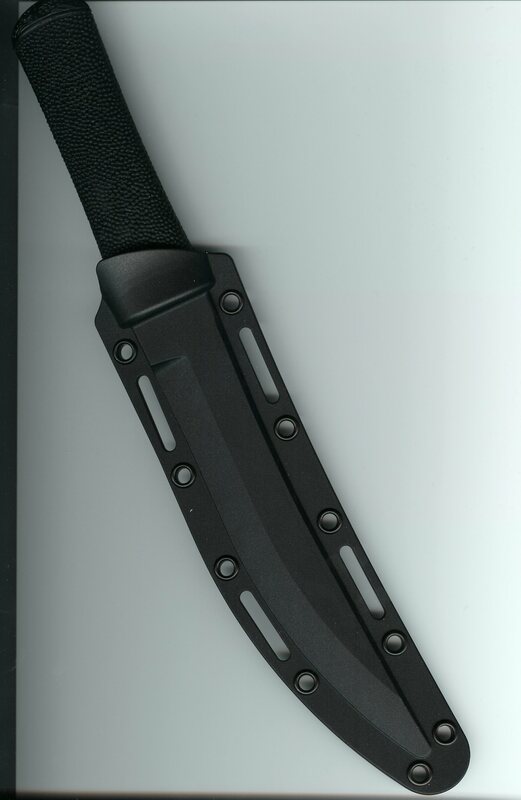 The knife has a serious tactical/fighting look to it, and feels good in the hand. The handle is particularly comfortable and provides for the aforementioned secure grip. The Hissatsu also appears to be well balanced for its intended purpose. If I had my druthers, I would give the blade a matte finish, and even a darkened (o.d. green or black) finish all over. On a tactical knife, it’s usually best not to have any reflective surfaces. Currently, the Hissatsu sports a kind of two-tone finish. The cutting edge part is a satin matte, while the spine and ricasso area are polished. Don’t get me wrong, the blade still looks cool. The Hissatsu has a VERY agressive look to it. You can tell it’s made for “poking” through stuff (and pulling out of stuff) quickly and easily. Also, for CCW/street use, a little glint might make for a little bit of extra deterrent value, in case you want to give an approaching attacker the opportunity to bug out of there, instead of engage you. 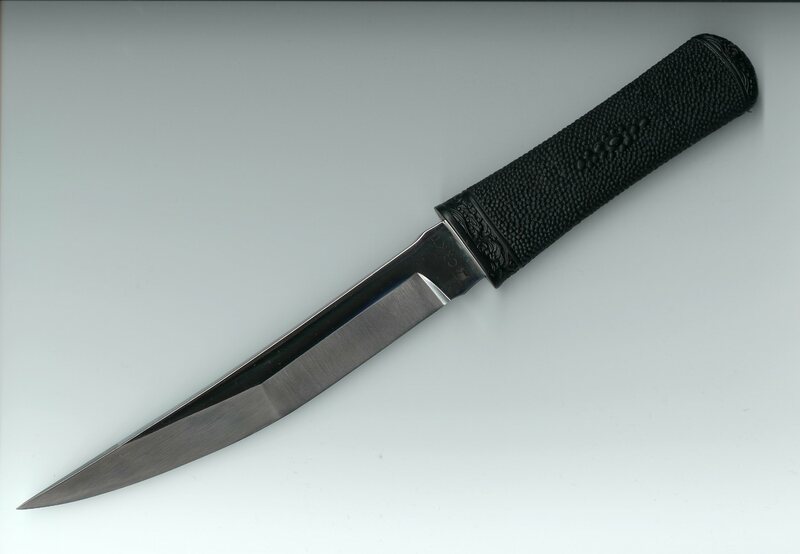 The Hissatsu comes with a Zytel sheath/scabbard, which can be seen in some of the pictures we’ve provided below. The sheath allows an operator to attach the Hissatsu to webgear. There’s also a belt attachment (not pictured) that can be attached to the sheath, so the Hissatsu can be carried in that manner. DefRev hasn’t yet had an opportunity to test the Hissatsu tanto knife out in any CQB-applicable way. To be honest, even if we did, I don’t know that we would. Remember, we’re not knife experts, over here. There are much more qualified people out there in this regard. Besides, the true test of the Hissatsu will be how it performs against human targets out there on the various fields of battle, if and when it is employed by U.S. military end-users/Special Operators. Again, the Hissatsu is not a camp or general utility knife. It is a killing tool, and it’s in that application that the Hissatsu will have to ultimately prove itself. Somehow, I have a feeling that in trained hands, the Hissatsu will perform exactly as it was designed to perform–efficiently. It will be interesting to see how the AUS-6M steel blade holds up under adverse conditions and real-world combat application. The reader can view the Zytel sheath that comes with the Hissatsu in the photo at left. The belt attachment is not pictured. If you’re interested in purchasing or inquiring about this knife, you should contact Bugei Trading Co./Ancient Edge by phone (toll free) at 1-800-437-0125. You can also reach them at 760-736-4785. Ask for Kevin. You can also email Kevin at [email protected]. The Hissatsu (along with sheath) can be purchased directly from Bugei for $89.99. At this price, the Hissatsu would appear to give the purchaser a lot of bang for the buck. Here’s the link to the Hissatsu sales and info page on Bugei’s site. The Ancient Edge website also has a Hissatsu sales and info page that can be viewed here. Price on this site is also listed at $89.99. 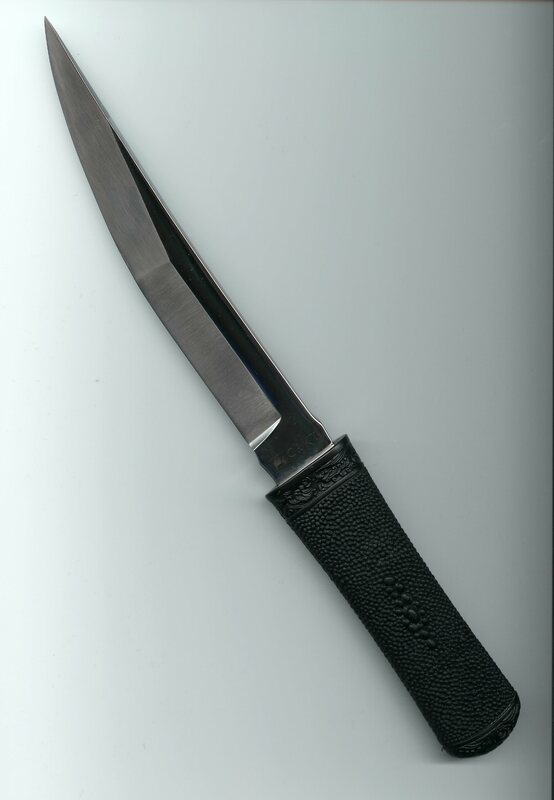 Click here to view an excellent page on the original “Hissatsu” knife. It contains some excellent pics of both the original “Hissatsu” and its original sheath/scabbard. Don’t know if the original sheath was made out of kydex or zytel. Clicking here will take you to CRKT’s page on the new “Hissatsu”. Clicking here will take you to Jame’s Williams’ “Dojo of the Four Winds” website. This is his martial arts school. One of the disciplines James teaches is Systema. Here’s a review article on the Hissatsu that was written awhile back by Brian Puckett. Click here to view a line drawing of an Osoraku-Zukuri style tanto blade. This pic comes from this webpage. Click here to view another line drawing of an Osoraku-Zukuri style tanto blade. This pic comes from this webpage. Click on this link to view a custom Osoraku-Zukuri style tanto made by well-known custom knifemaker Don Fogg. Click here to see another custom-made Osoraku-Zukuri style tanto blade. This one is Japanese. So is this one. This one’s a cool page.